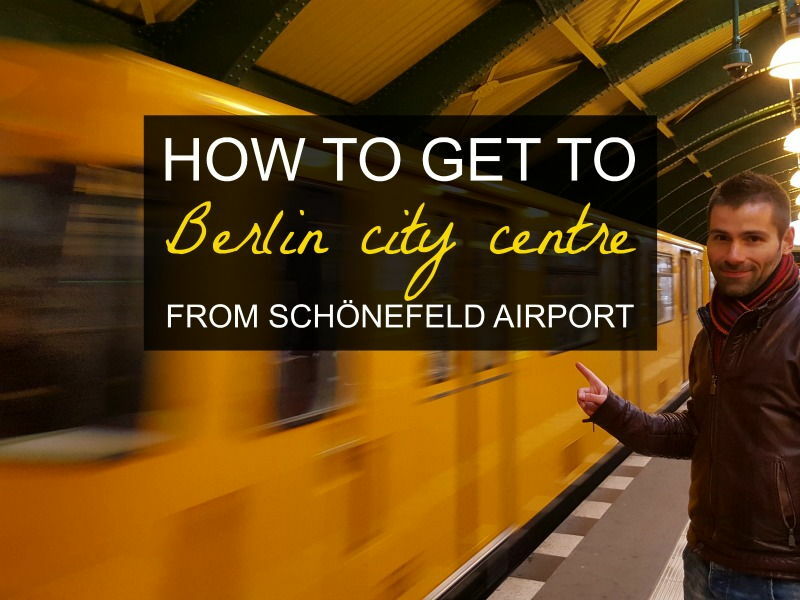 How to get from Schönefeld airport to Berlin city centre? Schönefeld (or Schoenefeld) is one of the two international airports for Berlin and the one you're most likely to arrive at if you fly in with any of the low cost airlines like Easyjet, Condor and Ryanair. 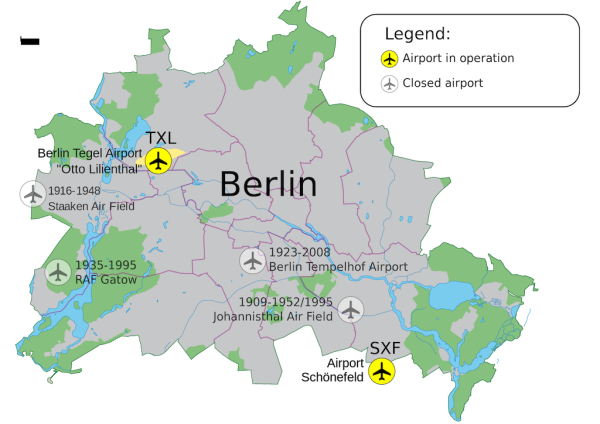 Schönefeld airport (or SFX) is located in the southeastern end of Berlin, 18km from the centre. It will be merged with the new Brandenburg airport (located very close by) when it opens in 2020. There are many ways to reach the city centre from Schönefeld airport. Following our many trips to Berlin, we show you the best ways to get from Schoenefeld airport to Berlin city centre. We also wrote about how to get from Tegel airport to central Berlin. First of all, if you're planning to spend a few days in Berlin and use the public transport system (Metro, bus and train), you should know that Berlin's ticketing system can be confusing especially if you've never visited Berlin before and you do not speak German. Also the ticketing machines during peak hours can get very crowded and you end up getting stuck in long queues. To overcome these problems and help tourists in Berlin, the tourism office has very cleverly created the Berlin Welcome card, which is a GODSEND when you're a newbie to Berlin. 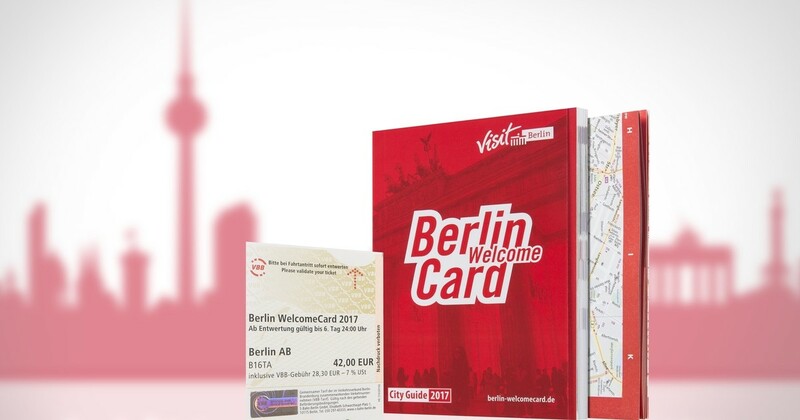 We strongly advise to purchase your Berlin Welcome card in advance. It will not only save you money, but you will also avoid any queues at ticket machines (a blessing at rush hour when queues are huge). The Berlin Welcome card gives you unlimited travel for a 48 hours, 72 hours, 4 day, 5 day or 6 day period. Make sure you buy the card for ZONE ABC which includes Schoenefeld airport. On top of that, the Berlin Welcome card gives you up to 50% off from many attractions in Berlin. Find out more about the Berlin WelcomeCard here. The airport express train is the fastest way to reach Berlin city centre from the Flughaten Berlin-Schoenefeld station, which is around 10 minutes walking distance from the airport terminal. The train runs every 30 minutes between around 4am to 11pm and costs €3.30 each way. The metro tickets in Berlin are valid for a 2 hours period. On weekends there's a night train at 1:44am. The airport express stops at Karlshort, Ostbahnhof, Alexanderplatz, Friedrichstrasse, Hauptbahnhof (Berlin Central station), Zoologischer Garten and finally at Charlottenburg. 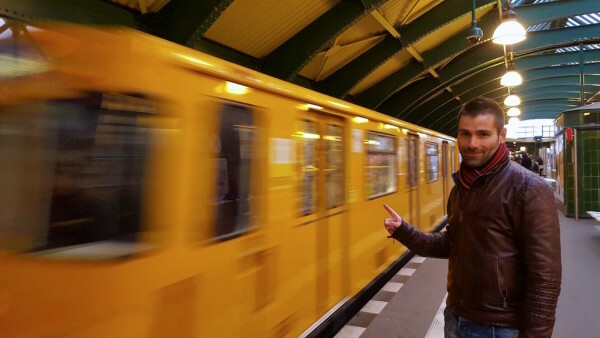 If you're going to be using the metro in Berlin a lot, which is usually the case, we recommend buying a Berlin WelcomeCard. TIP: remember to purchase it for zones AB and C. Normally you need only the AB ticket for most of the main tourist attractions in Berlin, but for the Flughaten Berlin-Schoenefeld station, you need zone C add as well. The metro in Berlin is referred to as the Bahn. 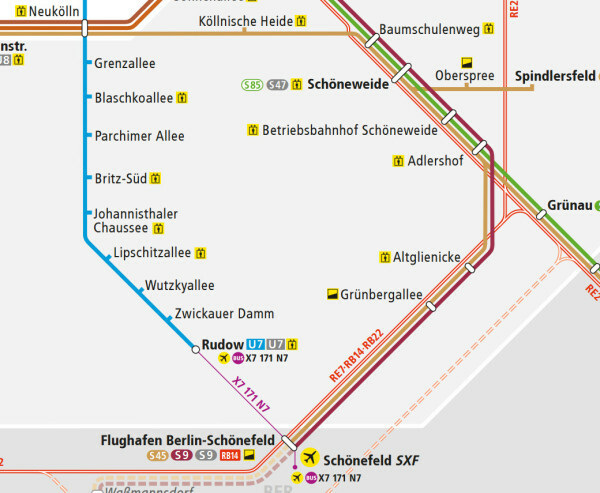 The main ones are the U-Bahn which goes underground, and the S-Bahn which is suburban. The S-Bahn runs all the way to the airport. It's not as convenient as the airport express and costs the same. However, the advantage is that the S-Bahn runs non-stop during weekends, so if your plane lands late or during the night, this is a good option to reach the city centre. S9 and S45 are ideal if you're looking to reach West or East Berlin. However to go to the city centre, you will need to change. Buses X7, 171, and night bus N7 depart from Schoenefeld airport go to Rudow U-Bahn station (first stop on the blue line U7). Then you can jump on the U7 line to go to Kreuzberg or Neukoelln. This is the best option for late evening arrivals on weekdays when you've missed the last airport transfer, there are no S-Bahn trains running, and you don't want to pay for a taxi/private transfer. If the night bus or public train does not appeal to you, you can use the public taxi. A metered taxi from Schönefeld airport to Alexanderplatz or Nollenderplatz (around 23km) will cost you around €45 – 50€ and you will find plenty of public taxis just outside SFX airport. If you're more confortable using an app, we recommend Uber. In Berlin, Uber is used as a taxi hailing app so when you get a taxi on Uber you end up riding one of the public metered taxis. The difference is that payment is automatically managed in the app and you get the convenience to hail your taxi directly from the app which is godsend when you do not speak German. Uber will also get you a fare estimate and allows you to choose your exact pickup and drop off location. Once the app has found your driver you never wait more than 3-5 minutes. If you have not signed up to Uber yet, download the app now, and type our invitation code sebastienc221ue which will get you your first ride for free. If none of the options above suit you, you can always book a private transfer service from the airport to the city center (or vice versa). You will have the peace of mind of knowing that someone will wait for you at the airport and look after you until you reach your hotel. In the past mainly for night flights, we booked our airport transfer with Welcome Pickups, and had not been disappointed. They are reliable, on time and you get a big car all to yourself with an English speaking local driver who points out the most important points of the city, and will also help you ordering skip the line tickets, sim cards, etc… for the same price as a taxi from the line. I’m have my return flight from the Schoefeneld Airport. If I want to take it on Alexanderplatz, is there any machines on the stop to buy the ticket there or where should I buy the ticket? Would be great to know. Sadly it is very complicated getting metro tickets in Berlin. You have to queue to buy them and then queue to stamp them- don’t forget to do this to avoid a fine! Another tip if you’re getting a train – there are no toilets at the station or on the train! We found out this last night and had to go all the way back to the airport to use the bathroom! It’s really crazy, but I called the DBahn information line to find out from which Hbf platform the RE7/RB14 leaves and the person taking the call was unable to tell me, even going so far as to state that she didn’t recognise the RE7 or the RB14 labels. She demanded instead the 18635 ‘Fahrtnummer’ as the only way to establish which train I wanted, except that changes per departure e.g., the 20:16 RB14 is the 18635, and the 20:47 RE7 is 3734 or 18796, but despite that, she couldn’t tell me the departure platform. Furthermore, and equally crazy, using the DB app and the VBB app, neither presented the option of taking the Airport Express for any journey between Hbf and Schönefeld. I had to find out which platform when I got to Berlin Hbf, but as my train was late (what! ), by the time I found out the 20:16 RB14 left from platform 11 and got to that platform, it was already too late, I’d missed it. Yeah – we found you need several PHDs to work out how Berlin’s metro system functions!! First get your ticket from machine at airport for zones ABC at a cost of euro 3.40. Then X7 bus to Rudow underground station, U7 sixteen stops to Mockernbrucke, change to U1 to last stop at Uhlandstrasa and that puts you onto Kerfurstendemin street which is on the main shopping/ hotel area. Hi my husband and I are visiting Berlin for the first time and have no idea how to get to Mitte from SXF airport. The more i read the more i seem to get confusedi . I would appreciate for some advice. Many thanks Rita from Malta. Thanks for the tips! I’d like to ask you at what time does the N7 bus start operating? We’ll land at Berlin-Schönefeld at 23:00 and would like to go to S Berlin-Charlottenburg and was wondering whether the N7 would already be operating at that time. Also, do you have a bigger map of the bus routes? Alteranitvely, are there shared shuttle buses which we can take from the airport? Check on the official website for what is available: http://www.bvg.de/en/. I just ran a search for around 11.30 pm and there are many options so you should not have any problems getting to S Berlin-Charlottenburg. Enjoy Berlin!!! Thanks Guys! This information is so useful! I have visited Berlin a couple of times, and I love it! I definitely want to go back! Figuring out public transportation always stresses me out at first. It’s so good in Europe though. Thanks for sharing! This is an awesome post! Many airports aren’t near the city centre at all. this is a great guide and will help a tremendous amount of people! We live in Bavaria and love going up to Berlin. One of the reasons it is so great is that the public transportation options are fantastic! Just like you said, there are multiple choices for getting to where you need to go hassle free and at decent costs as well! So true. Would love to visit Bavaria – heard amazing things about it!